One of my all time favorite foods/guilty pleasures is salt and vinegar chips. I’ve always been a big fan of vinegar – my mom has stories of me running around as a little girl, blond ringlets falling down my back, with a stench of vinegar from whatever I was eating. Pickles with my grandfather probably… 🙂 Anyhoo… I like vinegar, but apparently Argentina does not. They’ve got me covered on sweets, but when it comes to the mouth watering tarty vinegary foods, I’m on my own. So what happens when you get that craving that just won’t go away? You have to make your own! (kinda). I scoured the interwebs for a way to make my own S&V chips and found a healthier (and cheaper), but just as satisfying, option – so I thought I would share. Potatoes: I, personally, would stick with a nice russet potato, though you could experiment with others. It has a hardiness that holds up through the boiling/baking much better than say a yukon gold potato. 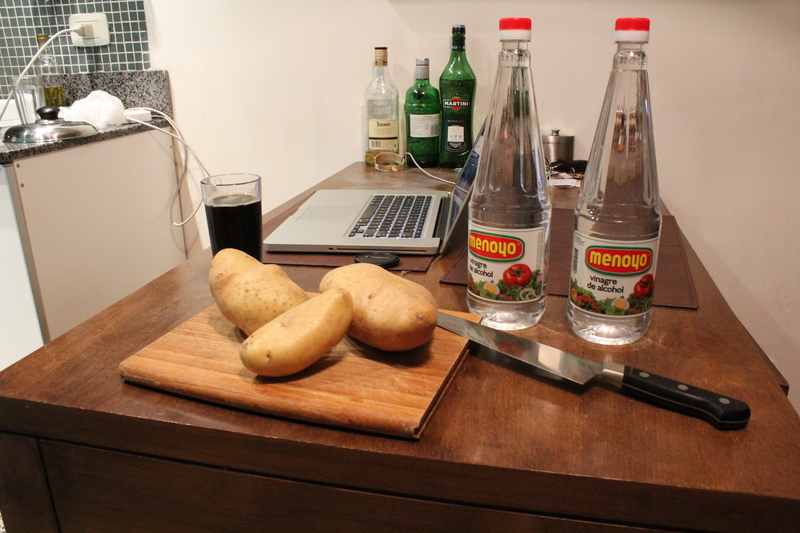 White vinegar: enough to cover the potatoes. I used about 1.5 of these bottles. 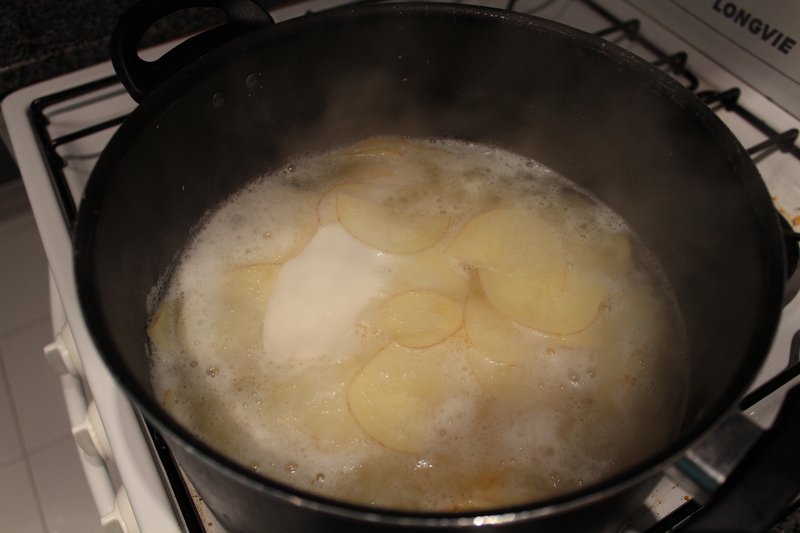 Also, on another note, you can experiment with other types of vinegar to give the potatoes a different flavor. I’m going to try adding some apple cider vinegar or some rice wine vinegar. The potatoes really absorb the vinegar flavor, so you dont want to go too crazy with really sweet vinegars, but I think a little extra pizazz could be a nice twist. Salt: A good sea salt is best for this. I used it the first time I made it and it came out really well. This time, we were out of sea salt so I used regular table salt. It was ok, but not the same punch and texture. Pepper: Fresh ground is ALWAYS best. So first you have to gather all the essentials… you got your vinegar, your potatoes, your knife, and of course, a nice dinner-making beverage. My beverage of choice on this evening was a dark Quilmes stout. Quilmes is the Budweiser of Argentina and their light beer tastes like it, but their stout is actually not so bad and only about $1.50 for a 30 oz/40 oz bottle. 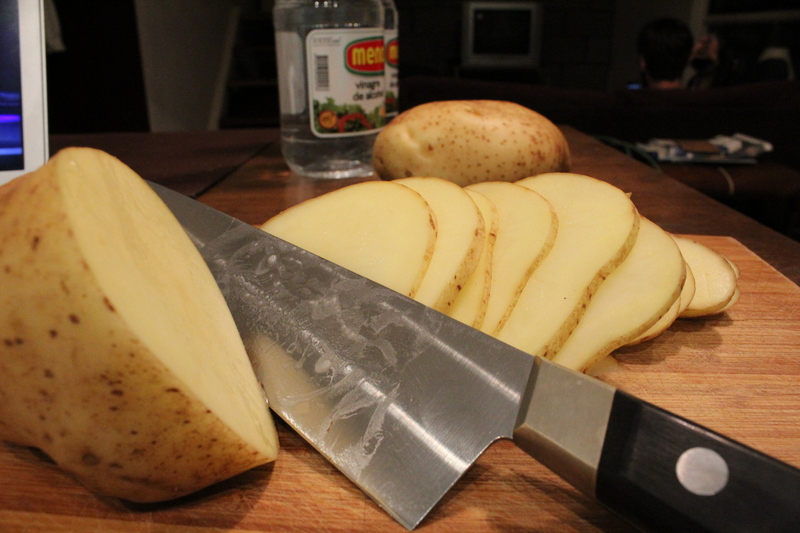 After you wash your potatoes, use the knife to cut them as thinly (and evenly) as possible. Keep in mind that the thicker you make them, the less flavor is going to be absorbed throughout the slice. So if you want a more subtle flavor, make the slices thicker than this. I’m not a subtle vinegar eater, as you may have gathered, so I try to get them as thin as I can. If you have a mandoline, I would recommend using it here. 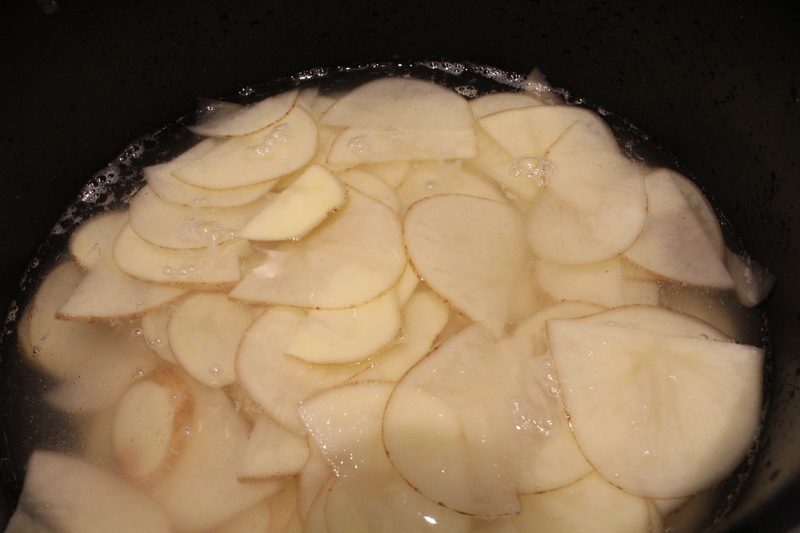 Place the potatoes in a large pot and cover them with vinegar – add vinegar until its about 1/2 inch above the potatoes. Yeah, it’s a lot of vinegar. Bring the vinegar up to a boil. It will start to get frothy. That’s ok. Reduce the heat and let it simmer for about 5 minutes. This is when your kitchen is going to get that mouth and eye-watering vinegar smell. Love it! Remove from heat and let sit in the vinegar for 30 minutes or longer if you want a stronger flavor. While you’re waiting, preheat your oven to about 425 or so. It seems as though thermometers are not a standard on ovens here, so consequently I have no idea how hot the oven is. I feel like I’m back in one of those old southern cook books… “prepare a nice hot oven…”. I put it up to a medium-high heat, but it could be a little hotter. You’re essentially roasting the potatoes so keep that in mind. 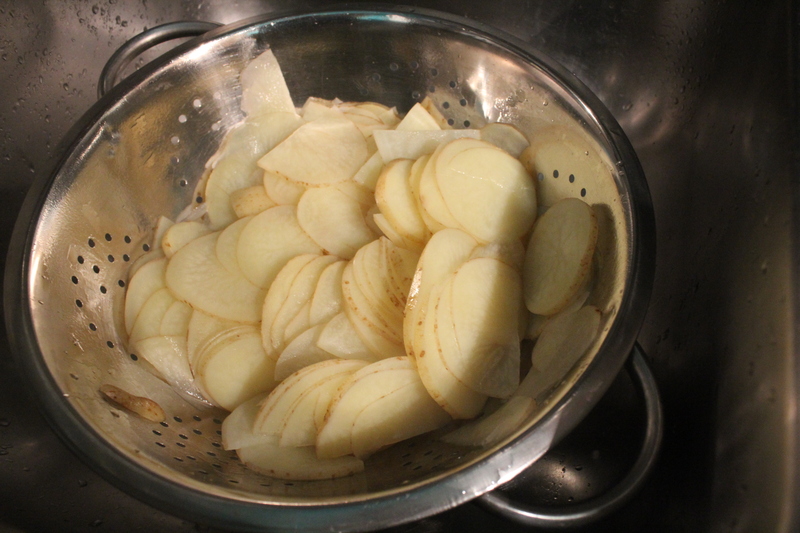 After 30 minutes (or so), gently dump the potatoes into a colander to drain. Then spread the potatoes on a couple layers of paper towels and pat the excess vinegar off. You don’t need to dry them, but just remove the excess liquid. The flavor is cooked into the potatoes, so you don’t really need the excess. 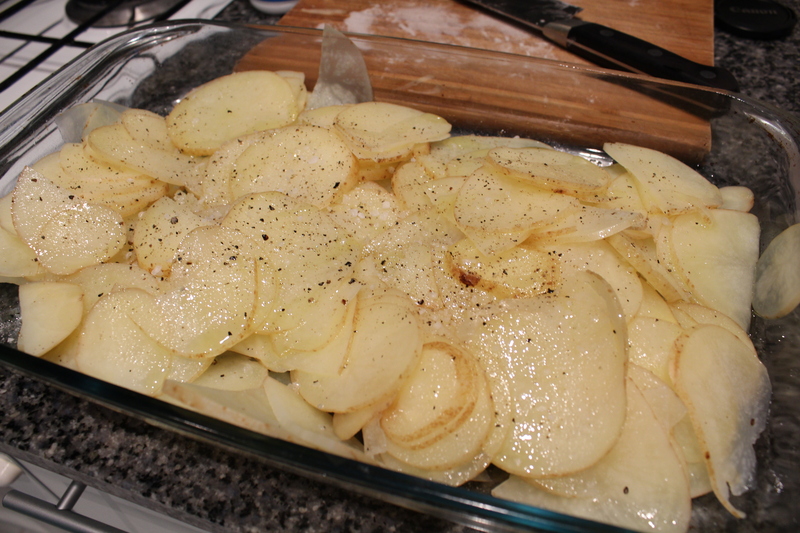 Oil your roasting pan and place the potatoes in. I’ve used a pyrex because that’s what we have, but you could also use a metallic pan with aluminum foil and oil to cover or maybe a cookie sheet with parchment paper. I may try this next time. The goal is to have one layer of potatoes. Unfortunately, we are a little limited on supplies here, so I had to double/triple up. They didn’t get the crunch that I would have liked, but that’s ok. So put the potatoes in whatever vessel you have and drizzle olive oil, sea salt, and ground pepper over them and gently toss. Place in oven and cook for about 30-45 minutes. Use a spatula to toss them a couple times to make sure they don’t get stuck on the bottom and that all potatoes get an equal time with the heat. Remove from oven when they become brown and crispy looking. (see the top pic for the final product. Yes, these are half eaten. I was so excited for the potatoes, I forgot to take a picture when then came out.) These don’t look exactly how I would like them. I think I have to up the heat and make them single layered – even if that means, sadly, less potatoes… That’s the beauty with cooking/baking I think – it gives you a little life lesson. If at first you don’t succeed, think about what you could learn/do different, and try again. If you never try then you never get S&V potatoes at all! I’ll let you know how any of these experiments go next time I get the undeniable urge for a little S&V. Necessity is the mother of invention – and this is culinary innovation at its best! Looks like a lot of work, for what we could go to the store and just buy. But that is probably part of the thrill of your trip. Learning all kinds of new things, some prompted by your current surroundings and some prompted in spite of your current surroundings. Looks like you guys are having a good time down there. I am envious.